It has been a month since the extremely bullish £750m+ tie up between M&S and Ocado was confirmed in the press. Admittedly, the talks between “Mango” and “Apricot” (the charming respective code names) were never the grocery sector’s greatest secret, with speculation being ever present over the past few months. Waitrose will exit the Ocado fulfillment offering in September 2020 and M&S will join… in a very well publicised JV capacity. Read below part 2 of my series which talks in detail about some of the most important factors that led to this change. Missed Part 1? Read it here! 3. So, what’s a potential next move? Assuming both parties are already wading through immeasurable amounts of data as part of the longer-term vision, some business agility should be centred on the current Ocado roadmap and how best it can service a core M&S customer segment. 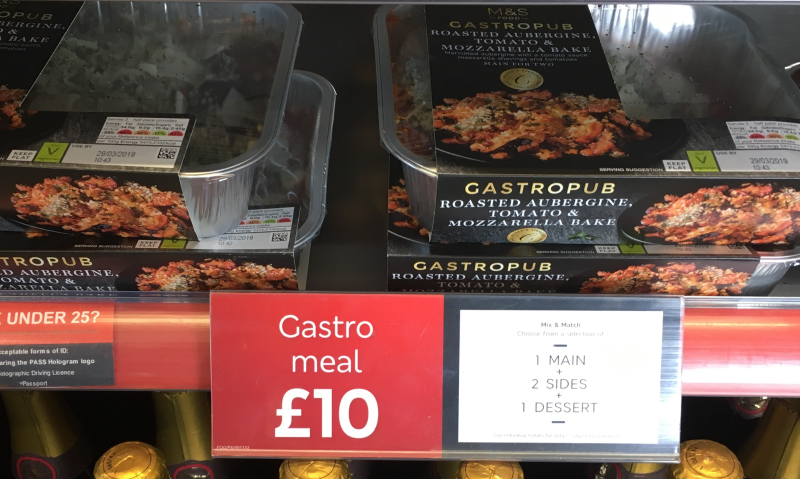 Whilst M&S aims to change market the perception of being primarily a “buy now for tonight” grocer, this is never going to be a market that will diminish for them. The number of successful Simply M&S stores is a testament to this (and it continues to grow). But then there is the basket value issue… how can an average purchase of sub £15 be made viable. This has always been an issue for M&S. Ocado’s standard minimum basket requirement of £40 for a typical weekly shop delivery would indicate that this problem remains. But, and it’s not new news, Ocado have recognised the importance of exploiting the ever-growing consumer need for “immediacy”. They are now trialing “Zoom” in certain areas of London. With a minimum basket value of £15 plus delivery, it is in effect a “primeroo” offering where a customer can expect a 60-minute grocery delivery… to both home or work… if you work or live in the Shepherd’s Bush area. A customer can already order a pretty decent selection of items (which of course currently still includes Waitrose) and the mobile offering is fairly rich, with good quality product information. Although, I would prefer to see nutritional traffic lighting if I was being slightly critical. But in the context of M&S there is the market sentiment for the brand that can also be brought to bear here. Zoom is still in early stage but with the cutover date of September 2020, M&S have plenty of time to position an enhanced convenience offering. Possible for September 2020? Just bung in a bottle of wine or a “Colin the Caterpillar” cake and it’s with you in 60 minutes! And it is not just that the customer can cut the 15-minute detour from the office to the tube or bus to pick up a ready meal. This will be “an M&S meal” remember. This harks back to my opening point: how will M&S create a weekly shop environment? It cannot be achieved through digital channels alone; it must be a unified objective from aisle to device. M&S is still a grocer, not a technology company. Perhaps another question to ask is how will M&S integrate Ocado tech into their own online capability? Will the Ocado Smart Platform be engineered (as a white label provision) as part of the M&S brand with the fulfilment remaining Ocado side, or is there something far bigger in the pipeline? … which leads nicely onto the matter of the Fashion and Home side of the business. M&S have been struggling to both rationalise the offering and really hit home here for some time, but they have never lost track of understanding who the core customer base is. And this represents an extremely valid entry point (it is not just about food shoppers). The key for them is to leverage that “family centricity” from the carpeted areas and into the tiled aisles. This needs to be integrated into the unified commerce approach, delivering smart merchandising across all channels. And I sense that the plans behind the deal will be significantly more than simply providing M&S with an online grocery checkout. Ocado CEO Tim Steiner’s quip about “we should have charged them more” is pretty indicative of this. The success of his venture will inevitably boil down to the level to which business owners will push for real customer understanding. This is not a technology issue. It never is. This is shop floor interaction, it’s qualitative research… and it’s hearing and listening to what both customers and those servicing customers need, in this case, to drive positive opportunity towards that change of perception. At Columbus, we recognise this and frequently workshop with organisations “away from the stack”. We help them to appraise or challenge the digital or eCommerce business goals in play and where they are positioned in terms of delivering measurable, positive customer outcomes. This forms the basis of technology and solutions that both underpin and drive real growth. And we go further, establishing key outcomes internally, to promote engagement and success from within. Let’s be clear… for M&S, thinking about stuff in terms of basket size is counter-productive. What they really want is to become part of the family’s weekly routine. So, what does that family need from M&S to make that adoption?